You’ve captured countless photos from your smartphone, but you’ve never once taken aerial shots from a drone. It’s time to take your photography skills to the next level. 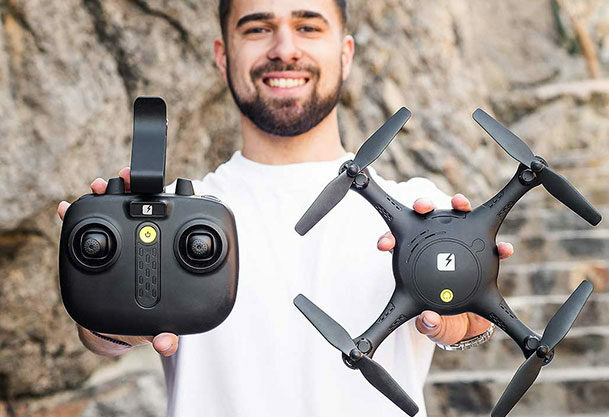 With the TRNDlabs Spectre Drone, you’ll be able to explore the world up to 50 meters away! Imagine all the stunning shots of the earth you can capture from up above. It doesn’t take years of training. In fact, operating the TRNDlabs Spectre Drone is extremely simple. Built with an unprecedented level of stability and control, the Spectre is the #1 drone for any beginner. Each drone possesses four high-speed propellers and 6-axis gyro sensitivity for a smooth landing. You’ll even be able to complete 360 degrees flips with precision. The TRNDlabs Spectre Drone is loaded with functionality. Not only can you capture HD photos, but you’ll also be able to stream a live feed directly to the Spectre app. There’s even an option that allows you to truly immerse yourself in first-person with the IRIS VR goggles (sold separately). The price drop brings your total for the TRNDlabs Spectre Drone to just $69. Be sure to use coupon code PREZDAY15 for an additional 15% off, which means it’s yours for just $58.65!